Hide away from the miserable weather with these indoor essentials that include candles, rugs, and doormats. Pick up these to get your home ready to banish the shivers and welcome the warmth. 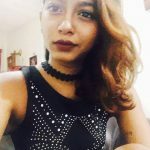 Miserable days are upon us: as we’re subjected to the rainy monsoon season, the Western world faces gloomy winter. So bust out the onesies and sweaters, and get cosy indoors. Pick up these essentials and get your home ready to banish the shivers and welcome the warm. You will need a warm blanket (or two) and no, we don’t mean the one you already have in your bedroom. Treat yourself with fluffy thick throws that will be perfect for those Netflix and Chill evenings in your living room. 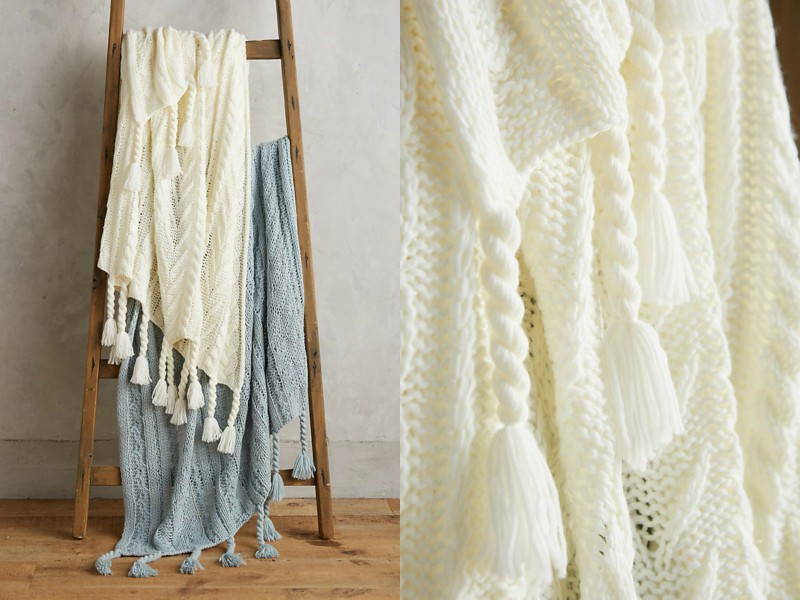 Anthropologie’s Tasseled Borlas Throw is a perfect addition to your living room. Its neutral tones will blend into any home and just look at how comfy they seem Plus points for the braided tassels that are so on trend. Major key alert! Candles are a cold weather essential for every home. 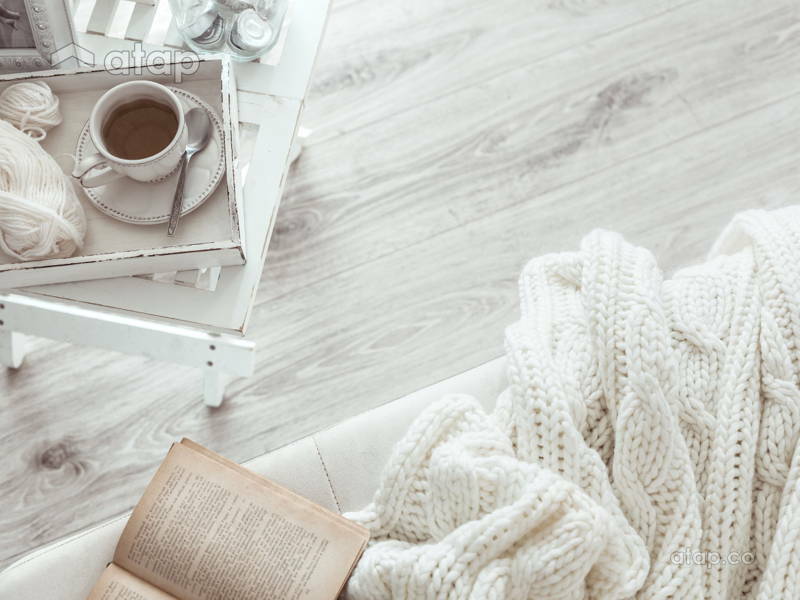 When the weather outside is frightful, you can turn your home into a sweet escape with exotic and warm scents that can change the entire mood and atmosphere. Not sure which scents to pick? We’ve got you covered with our list of fall candles (link). Cold season equals hot chocolate weather. Don’t believe us? Ask the internet. 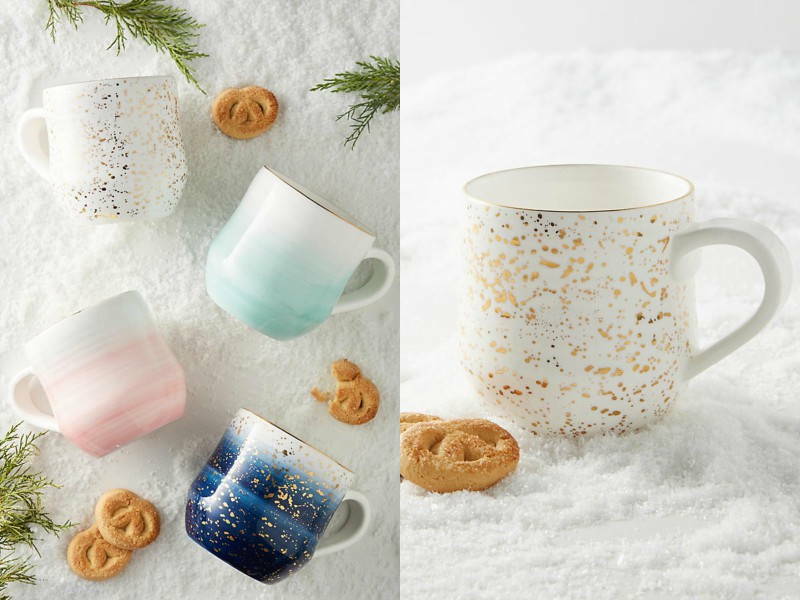 Get your hot chocolate fix (or your piping hot cuppa joe) with these seasonal mugs that are bound to perk you up. We love the Mimira Mug from Anthropologie; each ceramic mug is inspired by watercolour paintings aNd are finished with gold flecks! With the outside world being all doom and gloom, a little greenery indoors can be a welcoming sight and a mood lifter. Low maintenance houseplants can do the trick, and if you’ve got the opposite of a green thumb, then check out our list of Indoor Plants You Can’t Kill So Easily. Anyone else hates being rudely reminded of the cold when your bare feet touch the icy ground? Make walking around your home easier with the addition of thick (and furry) rugs. Who knows, you may fall in love with them so much that they become a permanent fixture in your home? 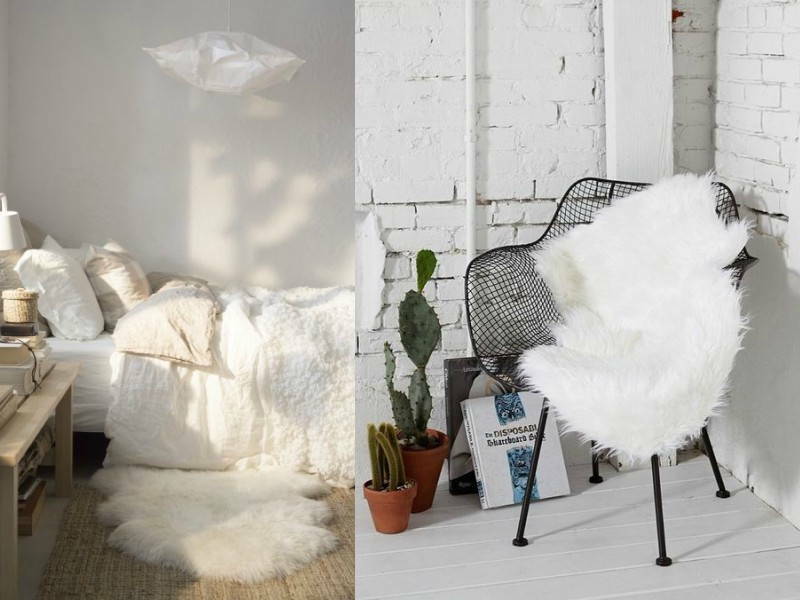 Pick up IKEA’s TEJN rug that is soft, warm, and cosy, all while being a chic addition to your home décor. Every home NEEDS a doormat at their entrance, especially during the rainy weather. You don’t want to be stomping into your home with drenched kicks and wet clothing. Get a mat that can soak up the excess water before you head into the comfort and warmth of your home. Adding a bright coloured doormat is a great way to add a pop of happy to the dreadful season. 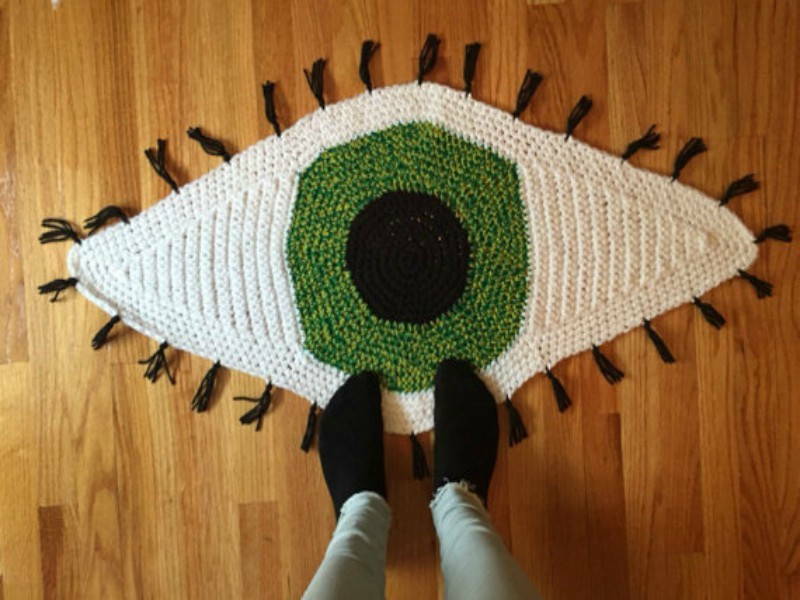 The Crochet Eye Rug from Etsy is literally eye-catching and we absolutely love it! The rug adds the perfect tinge of colour and character to the entrance of your home, separating it from the season’s gloomy outdoors.